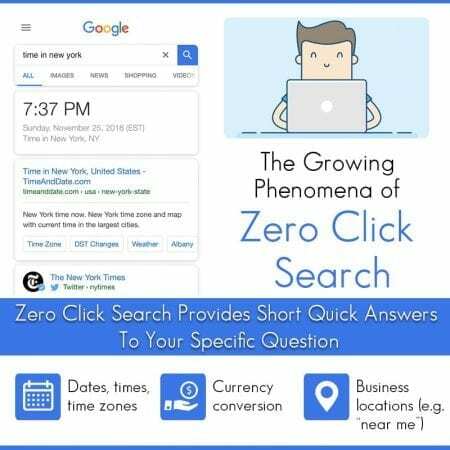 The phenomenon of zero click search is growing rapidly today. By implementing it in your keyword research and content creation you’ll be able to better optimize your website for Google. This is especially important if you’re trying to rank for terms related to currency conversion, time zones, or “how to” do something – things people simply aren’t clicking through to websites for. However, it’s important to realize that this is only the beginning. Now is the time to take some steps to prepare yourself for what’s yet to come. About 34.4% of all desktop searches result in these types of answers today, which means 62.5% of users never click through to a website – a number that’s constantly growing. At the heart of the zero click search lies some new SERP elements that have evolved because Google has adapted to new search behaviors, which include some mobile usage constraints. For instance, most of these searches are answered by a simple featured snippet known as a “knowledge card.” These answers are pulled directly into the SERPs so users don’t need to click through to a website. This is also true for knowledge panels and Google Instant Answers – other types of database entries that feature facts and information. Google argues this makes the search experience better for users who get the information they need without spending much time or exerting much effort, but it creates a problem for webmasters who need organic traffic to help them run their business. Get listed in the featured snippets by optimizing your content: To do this you’ll need to star by pulling a ranking report for your relevant keywords. Look to see which of these are ranking in positions 1 – 10 and which are already displaying featured snippets. By doing so you’ll be able to see what keywords pose the highest potential for getting you listed in the featured snippet position. Rework your current web pages to provide short, precise answers to relevant questions: When you do this, make sure you take the questions’ wording from things like existing snippets; the “people also ask” box; and related queries found at the bottom of the SERPs page. When your target keyword is a definition start your explanation by saying “X is a…” so you’re picked up by “what is” queries. When you have a table, shape your answer for a comparison query. Always mark up your answer with schema here so Google understands what you’re doing. When you want your images to show up, make sure it’s found directly under a paragraph, list or table and includes and alt tag that’s a variation of your paragraph’s headline. Optimizing your website for Google is definitely a challenge – one that’s made even more difficult now because of zero click search. With everything else you must concentrate on taking care of for your business, this is one more hassle you simply don’t need. Why not leave it in the capable hands of Local SEO Tampa Company? This is something many of their clients have chosen to do and are quite happy and satisfied with this decision. Reach out to them and do the same for your business today.